Ah, Oakland Mall. One of my regular childhood haunts! Never as cool and happening as my humble little #1 homebase mall, Universal City Mall (as it was called then, today it's just Universal Mall), but a close second. I really have lots of great memories of this place (Oakland Mall), especially the many midnight screenings of DAWN OF THE DEAD I took in at the mall's theater (Movies at Oakland ) throughout the early and mid '80s! Brother, that was living (dead)! 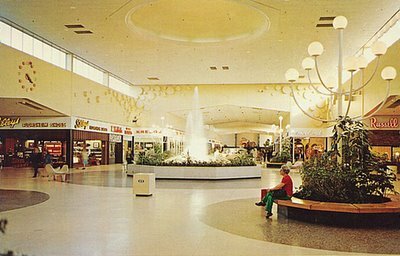 So here's a great shot above, of the mall's center court fountain area, at about 4:20 pm on some random day in the 1970s. Man, I sat around that fountain many, many times as a kid. This is also where Santa always sits, and all the mall's special events take place as well. They turn off the fountain (wouldn't it be funny if they didn't?) and throw a stage over it. A few days ago (September 9) the mall's westside anchor, Marshall Field's (which was originally a Hudson's store, back in the good old days), officially became Macy's, (like everywhere else in the known and unknown universe). You can read about the Oakland Mall switchover here and here, and you can also check out Google News for as much as you'd ever want to read on the sweeping Macy's conversion story. Note: Most online resources point to 1968 as Oakland Mall's original opening date, however, I've also found a couple compelling mentions that put it, instead, at 1965 (here's one), so now I'm not so positive about 1968. I'll contact Oakland directly and see if I can get a definitive answer soon. Jeez, Keith, I knew you were close to my childhood home, but I didn't know it was THAT close. For most of elementary school I lived between 10 Mile and 11 Mile, and between John R and Dequindre, making Universal Mall our home base. From sixth to 11th grades we moved to 13 Mile and Dequindre, and fancy-schmancy Oakland Mall became more of a destination. 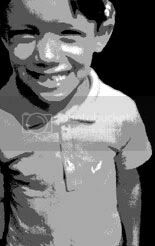 Great pic! Right there I tried frozen yogurt for the first time. Vanilla with strawberry sauce. Not far away, the Alpine (?) sporting-goods store was where I bought my first "real" tennis racket. Funny, I get conflicting sources not only for Oakland Mall, but also for the now-defunct Tel-12 Mall. People can't seem to agree if it opened in 1965 or 1968 either! I do remember the opening of Universal City, with its wonderful solar-system mosaic out front. There were giveaways at the adjacent Kroger (where my mom would work, and would eventually meet my stepfather), and I had my heart set on holding the winning raffle ticket for a gasoline-powered minicar from Dequindre Sales across the street. What year? Heck, I don't know. Maybe '69 or '70. Soon the mall's coin-collector kiosk, the nearby Woolworths and the Little Professor bookstore would loom large in my life. Being reminded the Marshall Fields in Toledo became a Macy's last Saturday as well. Toledo though originally had a few Macy's locations back in the late 70's/early 80's when a former company bought out the Lasalle chain here, and I remember that name too well for the stores that originally were located at Westgate, Northtowne and downtown (the Macy's logo still graces the side of the downtown building whose current name is Lasalle Apartments), those remaining stores were later sold to some other company in '84 under the name "Elder -Beerman". I also miss the glory days of Hudson's too! Though I hardly go to these places anymore myself (hasn't been the same since they ditched their electronics departments). I love the bubble theme of this mall, as reflected in the ceiling, wall design, lamps and even the clock. BTW, was Florsheim Shoes a national chain? I've seen quite a few of their shops on this blog. Yep, Cora, Floshiem was a fond national chain. They still make shoes but their own store locations have been vacant from malls since I think the late 80s or early 90s. I believe their shoes can now be found at discount stores like Kmart and Walmart. In the right hand corner it says "Russell" in a lovely script similar to Russell Stover chocolates. Did the candy company have their own store locations in malls at one point? I didn't know that they did. I love the cathederal-style gabled ceilings. An old chain I loved, Ivey's, used the gabled ceiling motif in its stores back in the late '80s. They looked a little different, but still very similar. I grew up only a mile from Oakland Mall. I think that 1965 and 1968 are both correct, sort of. As I recall, the East anchor, Sears opened several years earlier than the rest of the mall (probably 1965). My next-door neighbor, who moved in in 1965, worked at Sears from the day she came to our neighborhood. However, Hudson's and the remainder of the mall didn't open until 1968. Man, I can't tell you how much I miss the Oakland Mall. I live out of state now but grew up at that mall. Thru the 70's to the mid 90's that was the place to go. I remember it quite well before the "new" part was built. I lived over between Campbell and Rochester and 13 and 14 mile and we used to walk up there quite often in the summer during the 70's. Then, in high school in the 80's I would drive there to clothes shop then after college in the 90's I would see movies there and shop for CD's. When I get back to Michigan every few years I always make it a point to visit the mall. I was up there for a wedding last year and had some time to kill before my friends got off work. I spent most of the day at the mall just hanging out and reliving the past. Does anyone remember the name of the preppy store that used to be in Oakland Mall? I believe it was just outside of the old Hudson's. The sold preppy shirts, sweaters and docker style pants. I believe the name was made up of two words. I think you might be thinking about either DJayz or Merry-Go-Round, each of which sold the widely-popular I.O.U., Skidz, and Z Cavarichi (spelling?) brands in the early 90s. One of the stores was near Hudson's while the other was down the side hallway leading towards the newer 2-floor section and Harmony House. I can't believe how many people feel the same as I do about Oakland mall! I also live out of state but make a point to go there when I am home. We lived there on the weekends as a kid. When I think of Oakland Mall, I think of getting ice cream at Sander's and then getting makeup at Merle Norman. We would show up to Contempo Casual's before the store would open for their sales. This was early to mid 80's.